The Ice Age is also known as the Pleistocene Epoch, which lasted from about 2 million to 10,000 years ago, and was a period of recurring widespread glaciations. Ice ages have actually occurred periodically throughout the history of the Earth. The Pleistocene is the most recent of these ice ages. Glaciers covered most of the high mountains of Utah periodically during the Ice Age. Lake Bonneville, a large fresh-water lake, covered most of western Utah from 30,000 to 12,000 years ago. The Great Salt Lake is the remnant of this Ice Age lake. The animals that lived in Utah during the Ice Age included many of the same animals that we find here today, as well as many extinct forms such as mammoths, mastodons, ground sloths, and saber-toothed cats. Many of the extinct Pleistocene animals were very large and have living relatives who are usually much smaller. These large, extinct animals are referred to as the “Pleistocene Megafauna”. They became extinct at the end of the Ice Age, about 10,000 years ago. 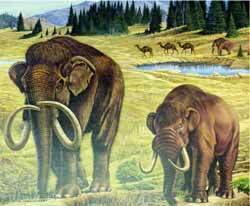 Mammoths and Mastodons are two types of elephants that lived in Utah during the Ice Age. They differ in the shape and function of their teeth and in the shape of other bones, including the skull. They are related to modern elephants that live in Africa and Asia. Gravel quarries along the Wasatch Front contain the bones of many Ice Age animals. These gravels were deltaic deposits formed in Lake Bonneville. The animals that roamed the shores of Lake Bonneville included big-horn sheep (Ovis), horses (Equus), and bison (Bison), whose living relatives are found in Utah today, as well as animals such as musk oxen (Bootherium bombifrons), camels (Camelops hesternus), and giant ground sloths (Megalonyx jeffersoni), who have living relatives in other parts of the world. Musk oxen are found today only in the Arctic. Ground sloths are now extinct, but are related to the much smaller tree sloths that live in South America. Horses and camels are both native to North America. After their expansion into other parts of the world, camels and horses became extinct in North America at the end of the Ice Age. Horses living in Utah today are descendents of the horses brought to the New World by the Spanish. The Saber-Toothed Cat (Smilodon californicus) is known from a site called Silver Creek, which is near Park City. The Silver Creek site is approximately 40,000 years old and contains fossils from animals that are still living today as well as from many that are extinct. The only saber-toothed cat bones found at Silver Creek are a canine tooth, a neck bone, and a humerus (front leg bone). The cast skeleton at the Childrens’s Museum of Utah comes from the Rancho La Brea Tar Pits in Los Angeles, California. 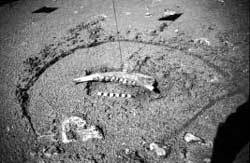 Hundreds of skeletons of predators such as the saber-toothed cat and the dire wolf (Canis dirus) have been found in the tar deposits at Rancho La Brea. Sites like this are called predator traps. 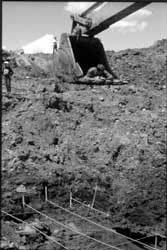 The Huntington Mammoth (Mammuthus columbi) was found on August 8, 1988 by a bulldozer operator working on the Huntington Reservoir Dam on the Wasatch Plateau in central Utah. He uncovered a front leg bone (the humerus) and a section of the tusk. The skeleton was about 90% complete. The Huntington Mammoth lived about 10,500 years ago, very close to the time of the mammoth’s extinction. 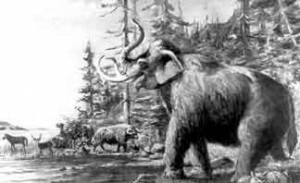 The site is located at an elevation of 9,000 feet, making it the highest elevation find at the time (since this discovery, mammoth remains have been found in Colorado at 10,000 feet elevation). This mammoth was a very old individual, as indicated by tooth wear and arthritis in its bones. Mounted cast skeletons of the Huntington Mammoth may be seen on exhibit at the Natural History Museum of Utah in Salt Lake City, the Utah State University (USU) Eastern Prehistoric Museum in Price, and the Fairview Museum of History and Art in Fairview. The USU Eastern Prehistoric Museum also has the original mammoth bones. 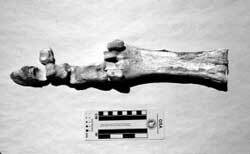 An upper jaw of the giant Short-Faced Bear (Arctodus simus) was also found at the Huntington Mammoth site. This giant bear, which was up to 50% larger than the largest living bears, was probably the most powerful predator of the Ice Age. Arctodus remains have also been found in Lake Bonneville gravel deposits in the Salt Lake Valley.